ItemDelay - this property specifies the delay for each series item toward the previous one. For example, if you have bar chart, when a bar item animation is started, the next bar item will start its animation with the delay specified by this property. TotalSeriesAnimationDuration - specifies how long will take the animation duration for a single series. ItemAnimationDuration – specifies how long will take the animation duration of each series item. DefaultSeriesDelay - controls when the rendering of the next series should start, compared to the previous one (i.e. the series index is taken into account). For example, if you have three series and DefaultSeriesDelay is set to 10 sec for each of them – the rendering of the 2nd series will begin 10 seconds after the first one is complete, respectively the rendering of the 3rd – 10 seconds after the second is complete. If you set values to ItemDelay and TotalSeriesAnimationDuration, then ItemDelay is omitted and TotalSeriesAnimationDuration is used. RadChart.AnimationSettings - use to control the animation used by default by all data series. These settings are used if there are no settings defined on ChartArea or series definition level. ChartArea.AnimationSettings - use to control the animation used for all the data series within a ChartArea. These settings are used if there are no settings defined on series definition level. ISeriesDefinition.AnimationSettings - use when you want to control the animation of each series definition separately. For example, when you have multi series charts and you want each one to be animated differently. As you can see, you can define AnimationSettings on several levels, but the apply priority is from more concrete to more general. This means that the animation settings defined for a single series have the highest priority and will override the settings defined in the ChartArea and the Chart. EnableAnimations - indicates whether animation should be applied on the chart or not. EnableStripLinesAnimation - indicates whether animation should be applied on the strip lines or not. 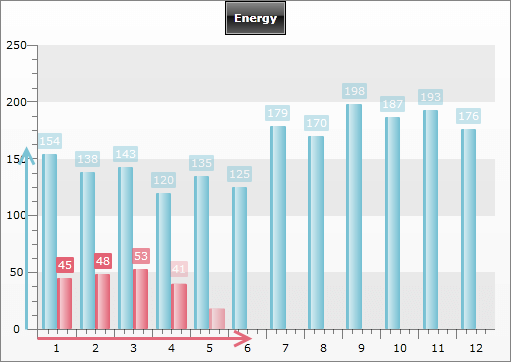 To make the first bar series look like it is growing: all the bars are shown immediately and then grows for 3 seconds. To make the second bar series show its item one after the other, but the total series to be shown again for 3 seconds. The image below is a snapshot taken in the middle of the animation. AnimationSettings are a simple and easy way to control your animations. However, if you need further customizations, you should consider using templates.